If a depression were passing over you, when would you expect there to be cloud, what sort of cloud would you see, and when would it rain? 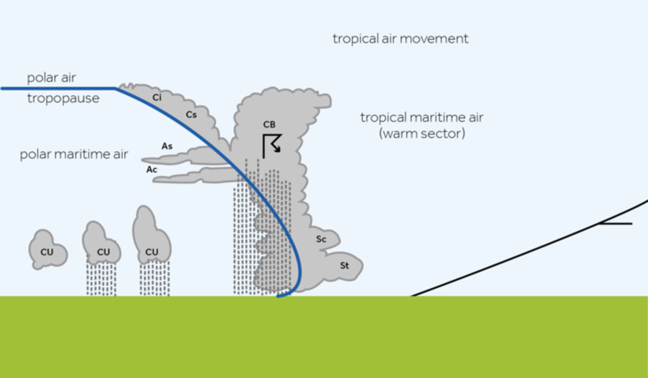 Figure 1: The weather associated with a warm front © Crown Copyright, adapted from image supplied by Met Office. Think about standing near the right hand edge of the diagram above. 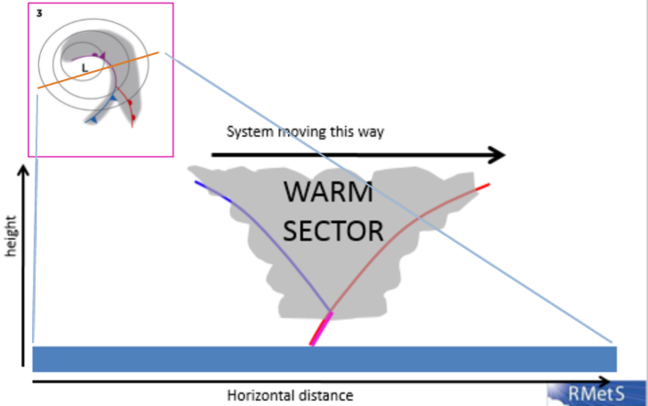 As the system approaches you from the west, the first thing that reaches you is the warm front, far above your head. 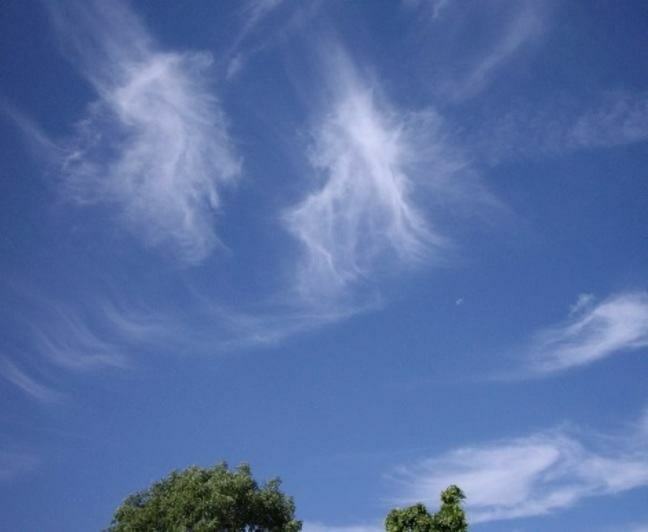 The clouds are on the front, so you will see high clouds, typically wispy, ice clouds called cirrus. As the front moves towards you, it gets lower and similarly the clouds get lower and heavier. You’re going to need your umbrella. 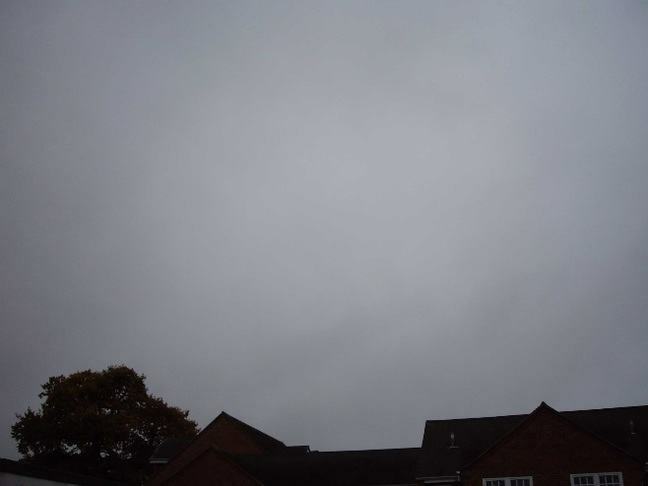 On the warm front, you’ll typically see featureless stratus or ‘sheets’ of cloud, becoming nimbostratus or ‘rainy sheets’ with a prolonged spell of rain when the front is near the ground. As the front crosses you on the ground, the temperature rises as there is a shift from the cold to the warm air, typically by a few °C. 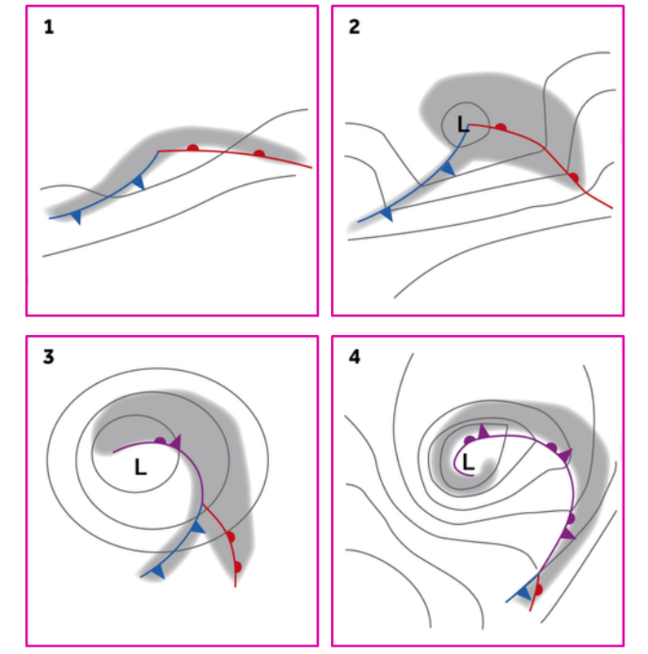 Winds turn clockwise, also known as a wind ‘veer’ (eg from southwesterly to westerly). The air pressure falls steadily ahead of and during the passage of the warm front, but then rises slowly after its passage. In the warm sector, the air may still be rising and it may still be cloudy and drizzly. The pressure begins to fall increasingly rapidly as the cold front approaches and rain usually starts not long before it arrives, becoming heavy for a short time. The cold front tends to be steeper than the warm front, with more dramatic weather. The cloud type on the front is a thunder cloud: cumulonimbus, with associated heavy rain and maybe hail, thunder, lightning or even a tornado. This is often accompanied by an increase in wind. The passage of the front is usually marked by a sharp change from falling to rising pressure and a veer (it changes its direction in a clockwise sense, eg from westerly to northwesterly) in the wind. As the rain dies away, the cloud lifts and breaks and, although there is sunshine, the air temperature falls. 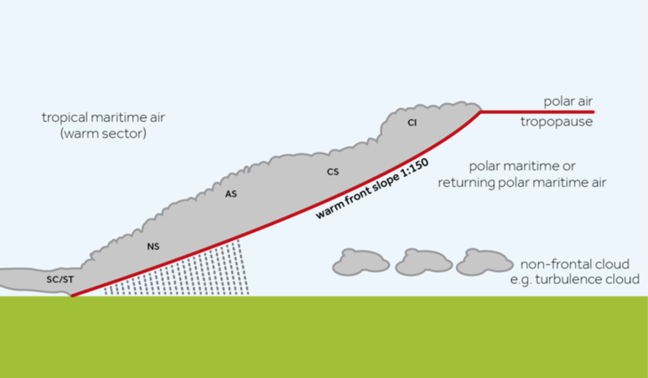 Figure 4: The weather associated with a cold front © Crown Copyright, adapted from image supplied by Met Office. The saying ‘red sky at night, shepherds delight; red sky in the morning, shepherds warning’ is linked to the passing of a depression. If the Sun, setting in the west, shines its light on a depression in the east giving a red sky, it is a sign than the depression has passed and that better weather can be expected for a bit. On the other hand if the Sun, rising in the east, shines its light on a depression in the west, then that depression has yet to hit the observer and is about to bring bad weather. 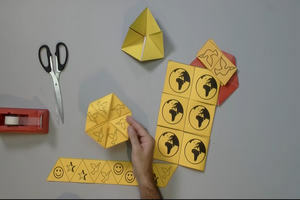 Now let’s consider what’s going on a bit later in the lifecycle of the depression (stage 3 in Figure 5). As with the previous scenario we’ll start by looking at a cross section, this time through the occluded front, shown in Figure 6. You can see the cold front has caught up with the warm front and has been pushed up. On the ground, the cold air from ahead of the system is directly in contact with the cold air behind. If you imagine you’re standing on the ground again you won’t notice much of a temperature change as the occluded front passes. However, the remaining warm air, squeezed higher up in the atmosphere, is still rising, so you’re going to still need your umbrella as there will still be cloud and rain.